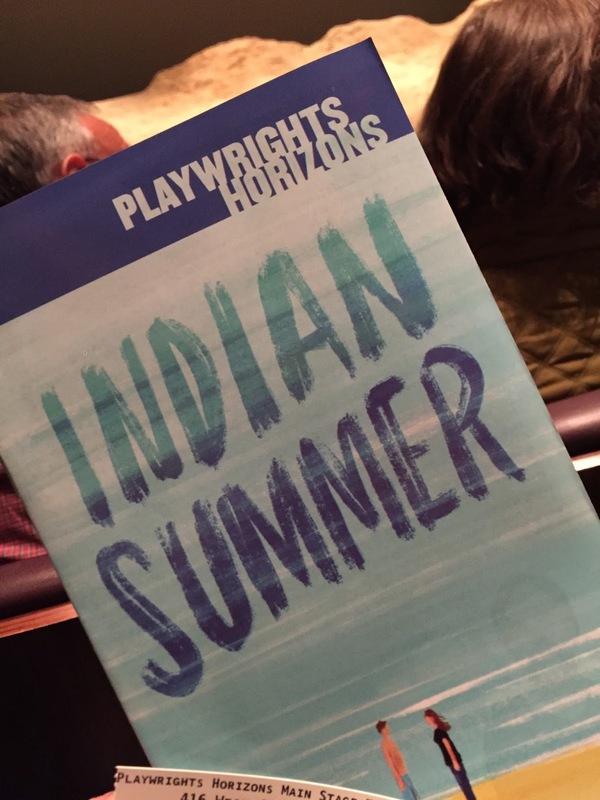 What I saw: “Indian Summer,”at Playwrights Horizons, on W 42nd between 9th & 10th Avenues. What I wore: black Fluevog calf-height boots, black tights, James jeans dark denim skirt, Brooks Brothers black cotton blouse, gray cardigan sweater from the Faroe Islands, gray rag & bone scarf, long jacket made of hand-woven fabric in Oregon that looks so much like something my mother would have worn I am incredulous that I actually bought it. What I did beforehand: cava and tapas and ice cream at Gotham West Market. Who went with me: the Bacon Provider, who required a bribe when he saw how long the play was going to be. How I got tickets: online, $10 off, about a month in advance. Why I saw this show: I liked the last thing I saw here. Taking the Bacon Provider to a play tonight. Don’t know what it’s about or why I chose it. Where I sat: Row D, seat 13, behind some of the Bats from the Flea Theater. Things that were sad: the plays dramatizes how very much class still dictates a young American’s future. Things that were funny: actors harass each other verbally and physically. Things that were not funny: actors harass each other verbally and physically. What it is: a play in two acts, with a fifteen-minute intermission, running about 130 minutes. Set on a Rhode Island beach in an unnamed town of that fake-contemporary time/place when people use modern slang but don’t carry mobile phones, this play still crackles with good dialog. It even has a satisfying second act. Who should see it: anyone who wants to hear what a Rhode Island accent sounds like without actually bothering to find their way to Rhode Island; people who always wanted to see an empty stage covered in a great quantity of sand. Previous Post I saw "Toast"